Before I started the 80 Day Obsession workout program, I wasn’t a huge fan of pre-workout meals. I barely ate anything, maybe a banana or apple if I was super hungry. The 80 Day Obsession changed that for me. The first time I did a workout, I was drained by the 30-minute mark. I could tell that I made a mistake. I should’ve followed the program and had a nutritionally balanced pre-workout meal. Here’s the thing. The 80 Day Obsession workouts are long and average 55-60 minutes. And because of the longer workouts, you really want to focus on your pre-workout nutrition to ensure you have the energy levels you need to get you through the workouts. What to eat. You need to eat a balanced pre-workout meal that provides the body with all the macronutrients it needs. How much to eat. If you eat too much too close to your workout, you will feel sluggish as your body uses energy to digest food. Now let’s go over how the 80 Day OBsession Timed Nutrition plan needs to be followed pre-workout. Ever been so busy you forgot to have lunch? How did you feel at 2 o’clock? Pretty worn out I’d guess. Allows you to put your all into the workouts. Helps to prevent muscle fatigue and damage. Luckily, the 80 Day Obsession program tells you exactly what type of foods you should be eating at the right times with its Timed Nutrition plan. This lets us work out at our maximum intensity levels for the entire workout with no surges in energy throughout. You need to eat your pre-workout meal 60-90 minutes before your scheduled workout. This will allow plenty of time for the food you ate to digest and not cause stomach discomfort during your workout. Keeping your pre and post-workout 80 Day Obsession workout meals as simple as possible will help you get the foods your body needs without spending too much time in the kitchen, which if you’re like me is HUGELY helpful! 1.) Egg, Veggie, and Potato Scramble: Add 1 tsp of olive oil to a frying pan, add a yellow container of cubed potato that has been softened in the microwave, add your favorite veggies, add a couple of eggs and scramble until cooked through. 2.) Protein Breakfast Sandwich: Cook 1 piece of ham, turkey or chicken sausage in olive oil. Place on 1 slice of toasted whole-grain or sprouted bread and serve with a green container of your favorite veggies. 3.) Protein Smoothie: Mix 1 serving of protein powder, 1 serving of greens, 1 tsp of a healthy fat, and if you are following meal plan D through F, you can a serving of fruit too. Remember a serving of your favorite yellow container, which can even be ground oats to blend into your smoothie. Favorite tip: Add a few ice cubes to make it more smoothie-like. 4.) Chicken, Rice, and Veggies: Perfect if you are looking to meal prep your pre-workout meals. Bake or steam a few chicken breasts, cook a couple cups of brown or wild rice, and steam a few servings of vegetables. 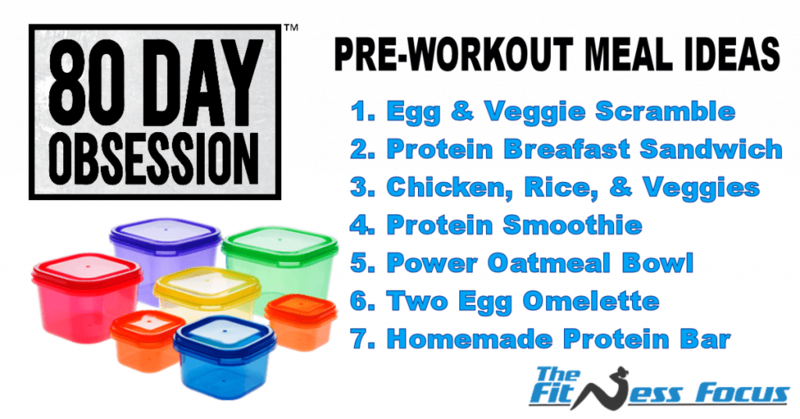 Separate into meal prep containers for multiple 90 Day Obsessed pre-workout meals that can last you a few days or more. 5.) Two Egg Omelette: Similar to the egg and veggie scramble. In a bowl, combine a couple eggs, veggies, a little meat (if you like), add 1 tsp of olive oil to frying pan, pour in your egg mixture, allow to firm and fold in half until firm. Serve with a side of your favorite yellow container. 6.) Power Oatmeal Bowl: Cook 1 yellow container of oatmeal, add 1 tsp of nut butter, and 1 red serving of protein powder and mix. Serve with a green container on the side. 7.) Homemade Protein Bar: Another great option is to make your own protein bars. 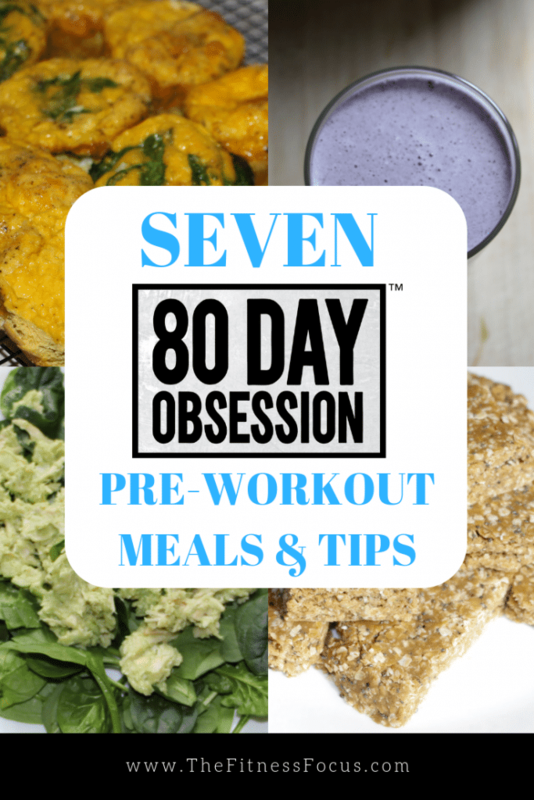 With a few ingredients like oatmeal, protein, powder, nuts or seeds, you can easily prepare a week’s worth of nutritionally balanced 80 Day Obsession approved pre-workout meals. If you’re following 80 Day Obsession Meal Plans D, E and F, you will also need to have a serving of fruit (purple container) pre-workout. This is because at a higher weight,people need more calories according to the 80 Day Obsession meal plan levels and the extra glucose that the fruit supplies to exercise at a more intense level. Plans D, E, or F of the 80 Day Obsession meal plan require you to have a serving of fruit. While you technically could have any fruit, there are some that are better. Any of these fruits are quick to digest, provide you with energy, and are good regulators of blood sugar levels. Fruit should be eaten alone if possible. I would try to eat your serving 30 minutes after your whole food pre-workout meal and 30 minutes prior to your workout. Okay I admit I might be going overboard here and this is not mentioned in the nutrition plan at all, but being me…I feel like you should know since this program is ALL about maximizing workouts with the timed nutrition to get you the best results. What are your favorite pre-workout meal? Please leave a comment below. Thanks for your blog. Really helpful particularly on nutrition and workout meals.